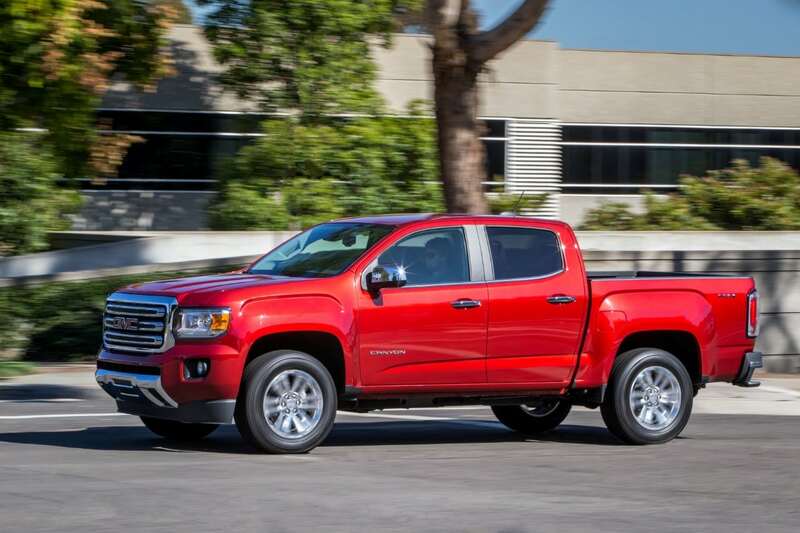 It seems every carmaker is back making AND promoting mid-size trucks. 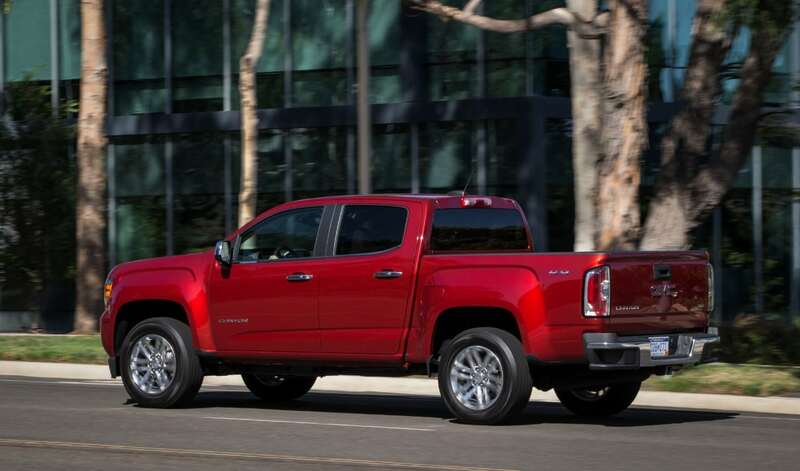 General Motors, who had gotten out of that segment briefly, is back in with the Chevy Colorado and the GMC Canyon. The Canyon is my tester this week. To backstory things a bit, the Canyon (and Colorado) had been discontinued for a few model years. They were stale, outdated and just couldn’t find their niche. During last year’s North American International Auto Show (NAIAS) General Motors held a coming out party for these two small trucks. And ever since then, they’ve been a big deal. This new version of the Canyon is certainly modern. 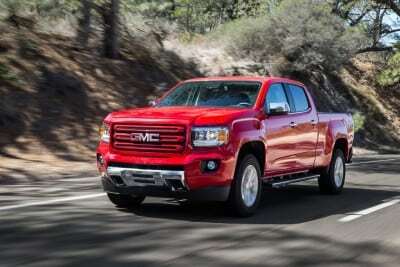 The redesigned body has updated features that make it look both rugged and handsome. The grille is masculine, but not overbearing in its styling. Bulbous extensions over the wheel wells are a nice touch, which add distinction to the Canyon. Its smallish frame is well disguised, and upon first glance it almost seems like a full-size truck. There are two bed sizes for the Colorado; a 6’2” bed (available on both Extended Cab and Crew Cab trims) or a smaller 5’2” bed (on the Crew Cab trim only). The Canyon is most definitely a truck and not some frilly daily driver (like the now discontinued Avalanche). 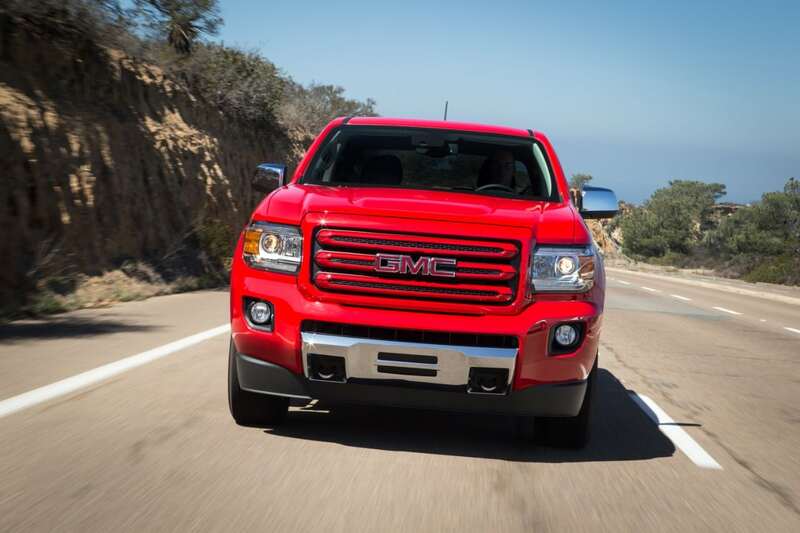 The Canyon has a maximum trailering capacity of 7,000 pounds. This makes it a fantastic option for the weekend warriors and those with recreational vehicles. There are two engine offerings for the Canyon. 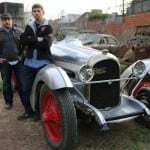 A 2.5-liter inline four-cylinder engine makes 200 horsepower and a 3.6-liter V6 engine produces 305 horsepower and 269 lb./ft. of torque. Consumers need to make the right choice, as the smaller engine only allows for a maximum towing capacity of 3,500 pounds. In this regard, the 2.5-liter engine is most definitely small with small performance. My tester was the bigger 3.6-liter engine and I was quite impressed with the overall performance. It drove like a truck. It was well powered offering plenty of torque yet handled in a nimble way. In this way, the small size works to the Canyon’s benefit. Too often full-size trucks are hulking, rigged and difficult to park. The Canyon is none of those things. 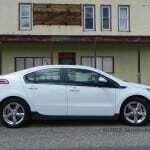 The six-speed automatic transmission had some inefficient moments. During the lower gears it held back the shifts while RPMs went to more than 4,000 rpms. Hopefully the dated transmission gets addressed in the next model year. 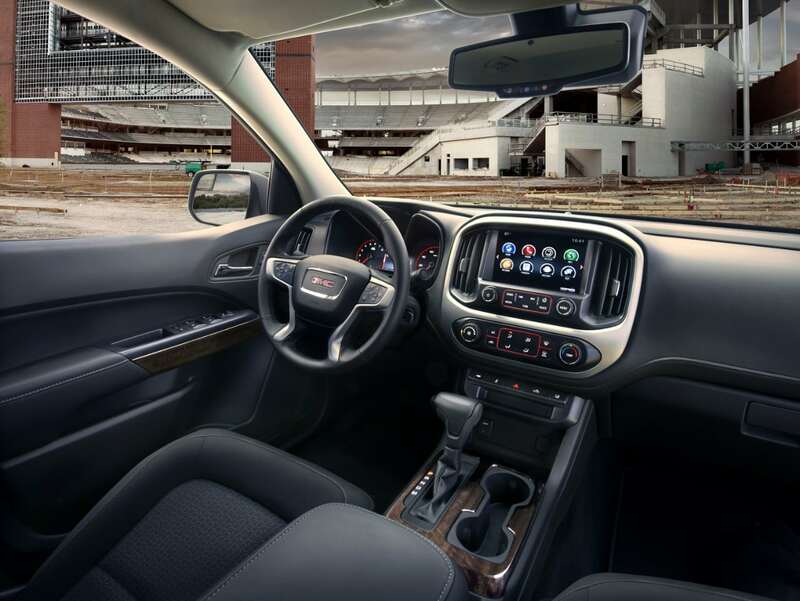 We’ve grown used to expecting higher quality materials that teeter on luxury with the GMC brand, and with the Canyon, you won’t be disappointed. Inside, it’s well appointed with soft touch points throughout. These softer materials and padded door panels help keep road noise to a minimum. There is 41.4 inches of front headroom and 45 inches of front legroom. Rear passengers enjoy 38.3 inches of headroom and 35.8 inches of legroom. So, again, the Canyon feels bigger than its size indicates. GM’s IntelliLink infotainment system is improved inside the Canyon. An 8-inch color touchscreen features big, bright icons that make navigating the system simple and easy. 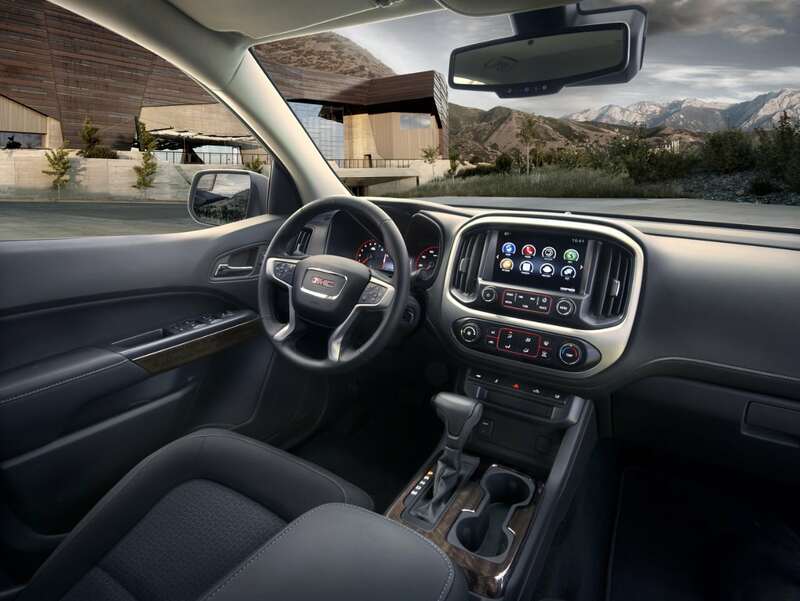 The Canyon has four trim levels, two bed lengths and even has a two-passenger option. I test drove the top-of-the-line SLT trim. Base price of the Canyon SLT is $37,250. With additional features and options, including chrome accents and an improved audio system, my tester had a final price of $40, 290. Smaller Canyons with fewer features can be had for under $30,000, which is why these smaller trucks are becoming so popular. 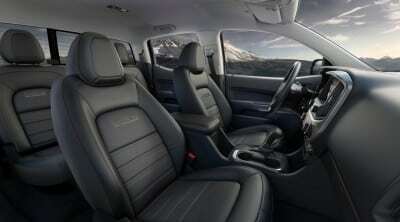 Fuel economy for the Canyon with all-wheel drive is 17 mpg/city and 24 mpg/hwy. 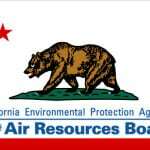 The two-wheel drive version has an EPA rating of 18 city and 26 highway. Look for the mid-size truck segment to increase in popularity over the next several years. 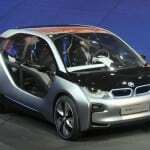 The resurgent segment has each carmaker racing to bring back or unleash their latest offering. General Motors’ higher end GMC Canyon is certainly a contender within this segment. 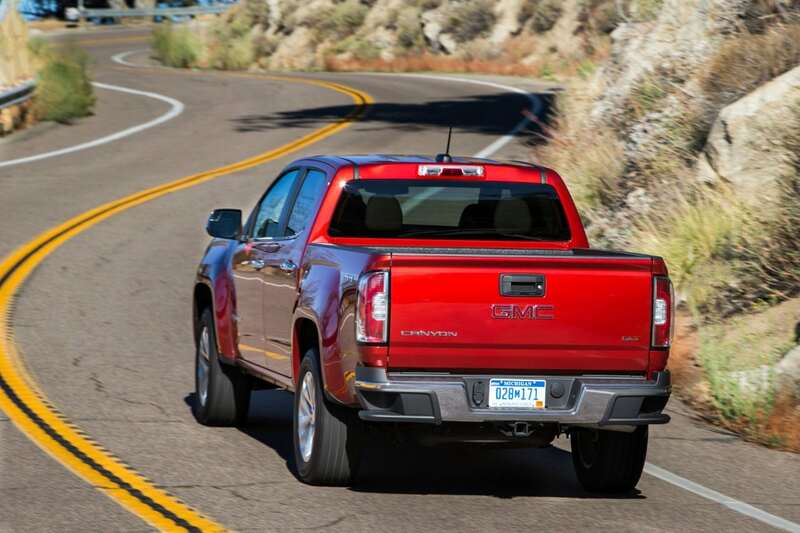 While some truck snobs may dismiss it due to its smaller size the Canyon overcomes any misgivings about it being too small or not powerful enough. 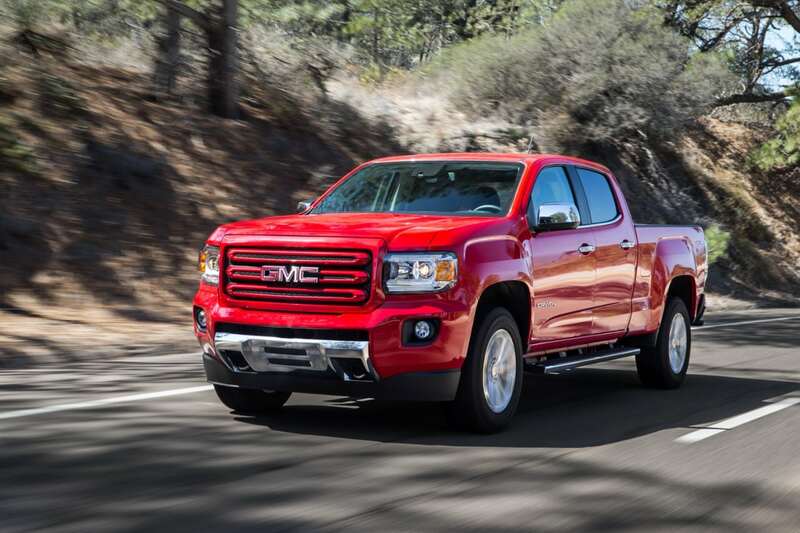 This smallish truck offers a big performance.